'The Killing': 'Twin Peaks' Meets '24' On AMC The new AMC drama The Killing tells the story of the murder of a young girl from three different perspectives. TV critic David Bianculli says the show is "AMC's most depressing series yet" — and explains why it reminds him of The X-Files, 24 and Twin Peaks. 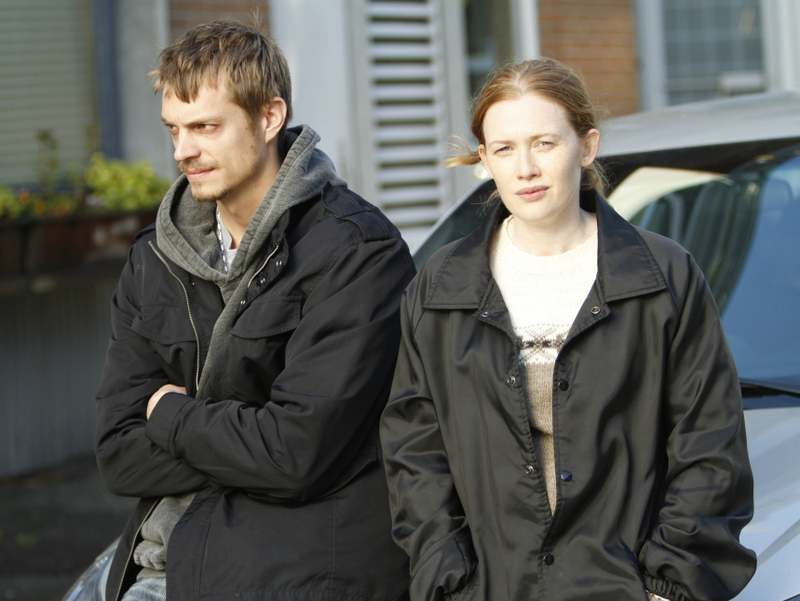 Joel Kinnaman and Mireille Enos star in The Killing, a new AMC drama based on a Danish miniseries. In literature, and in TV and movies, some of the world's best-known recent crime series have come from Scandinavian countries. Sweden has given us mopey police inspector Kurt Wallander and, even more famously, The Girl with the Dragon Tattoo. There's even a name for this genre now — critics are calling it "Nordic noir" — and this Sunday, AMC throws its hat into this global ring of gloom, doom and depressing murder mysteries by presenting The Killing, a new adaptation of a 4-year-old miniseries hit from Denmark. This Americanized version is set in Seattle, and the cloud cover and oppressive rainfall count as important minor characters. And while the inspiration for this series comes from Denmark, the unusual structure and tone of The Killing can be traced to a few groundbreaking American TV series: 24, Murder One, The X-Files and Twin Peaks. And if you can't imagine what those four shows could possibly have in common — well, here we go. Murder One was Steven Bochco's landmark 1995 TV series — more of a miniseries, really — which took an entire season to solve a single murder and take that case to trial. That's the patient approach that The Killing takes as well. The entire season is about a single murder — of a high school girl — and how two cops work to solve it. Like 24, each episode dramatizes a finite period in the story. With 24, it was real time: Each hour of TV represented an hour in Jack Bauer's very bad 24-hour day. But in The Killing, things are a bit more condensed: Each hour of TV time represents a day in the investigation. Like Twin Peaks, it's a show set in the Pacific Northwest, which begins with the murder of a local girl and dwells on her parents' painful, shocked grief. The music, the imagery — even some of the plot details — will remind you of that famous series, but there's none of David Lynch's metaphysical whimsy to lighten things. This series is dark, dark, dark — just like the Seattle sky. Actually, it's the Vancouver sky, standing in for Seattle, but you get the idea. Finally, like The X-Files, The Killing pairs two very dissimilar investigators, who come with different styles and perspectives. Sarah Linden, played by Mireille Enos, is the lead detective on the case, even though it's supposed to be her last day on the force before taking a leave to get married. Stephen Holder, played by Swedish actor Joel Kinnaman, is supposed to be her replacement — but as they work together, their styles often clash. The Killing is intentionally slow, and doesn't provide any of the usual staples of the genre as high-octane relief. No gun battles, no car chases — just cops doing their duty, politicians looking for ways to spin things to their advantage and parents facing their worst fears. There's one scene, in which the parents are called in to identify the body of their daughter, where their individual reactions are nonverbal, unconnected and emotionally scalding. The husband and wife don't even hold or look at each other. In that awful moment, they're hit by their own individual grief. It's astoundingly good acting — but, like so much of The Killing, it's tough to watch. But it deserves to be seen — and the persistence of these detectives is a little reminiscent of Columbo, where their unassuming, unorthodox approach ends up unearthing certain hidden clues — and, at the same time, getting us to root for them strongly along the way. The Killing is AMC's most depressing series yet — and this is from a network that has given us apocalyptic zombies and a terminally ill crystal meth manufacturer. But just as I came to love, and recommend, The Walking Dead and Breaking Bad, I'm doing it again with The Killing. Just don't tune in for a USA Network-type lighthearted romp, or you'll be sorely disappointed. David Bianculli is founder and editor of TVWorthWatching.com and teaches TV and film history at Rowan University in New Jersey.